The latest Southern Wind WINDFALL combines luxury and comfort with cutting edge technology in a way that has rarely been seen before. 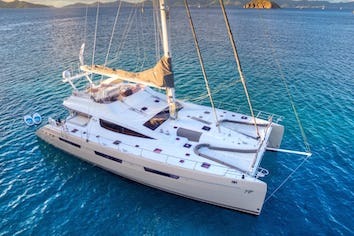 Performance sport is clearly the core of this yacht but she is equally proud of her crusing comfort. 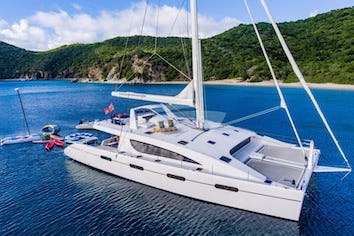 This intelligent and beautiful collaboration between Southern wind shipyard, Reichel Pugh and Nauta Design has resulted in a sense of great comfort and security whilst sailing. Wind 78 Whisper as captain. Cruised waters: Mediterranean Sea, Atlantic Ocean and Caribbean Sea. Job description: he is responsible for navigation, safety, overall running and financial management of the vessel, crew and guests. Ensures safe and efficient operation of the yacht at all times including compliance with all safety procedures and regulations.Takes care of adhering to flag, port state and local laws and regulations. Manages the crew to ensure compliance with, and understanding of, the vessel’s policies. Provides daily crew leadership and encouraging teamwork and individual, personal attention. Delegates duties, keeping the overall supervision of crew tasks. Licenses & certificates: RRYA/MCA Yachtmaster Ocean, Commercial Endorsement - STCW Training - STCW Proficiency in First Aid – Automated External Defibrillation certificate - GMDSS GeneralOperator’s Certificate - RYA Small Craft Radar - RYA Diesel Engine Maintenance Certificate - ISA Level 2 Coaching certificate, all classes. Education: Dublin Business School - BA Honours in Business Studies. He started his professional seafarer career working for the Royal Cork Yacht Club in the maintenance of boats and driving the race committee boat. He took part in several yachts deliveries and worked in the maintenance of sailing yachts. 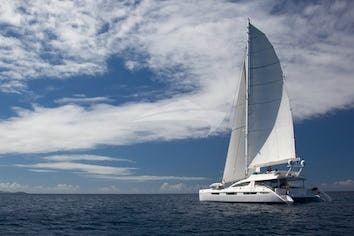 He also managed a group of companies involved in the yacht chartering, managing of marinas and providing yacht services. His extensive sailing experience is testified by more than 40.000 miles sailed in the Mediterranean and Atlantic Ocean and by his wide racing activity, ranging from sport boats, like 1720 Irish and European Championships, to International Dragon, various IRC races like Irish IRC national championship which he won twice, or Cowes Week and Cork Week, where for 3 times he scored first in overall & class. He also raced in superyachts events like the Rolex Maxi Worlds, Le Voiles de St. Tropez, the Loro Piana Superyacht Regatta in Sardinia and, Superyacht Cup in Palma and the Ibiza Rendezvous Regatta. He also participated in some offshore races such as the Caribbean 600 and various other RORC Offshore races. At a very young age, she started her professional career at sea working with a powerboat rescue team, for a variety of sailing events in Dublin Bay, including the Special Olympics in 2003. At the same time her passion for sailing brought her to become also a sailing and racing instructor at the Royal St. George Yacht Club in Dublin and Chicago Sailing School where she worked also as skipper chartering J24s and J22s. She qualified for the Irish 420 team in 2004 and 2005, competing in the World Championships and European Championships in Portugal, Italy and France. Thanks to her stewardess and deckhand skills she worked onboard Maxi Yachts such as ‘Hammer’ and ‘Axia’ taking part also to racing events such as the Saint Barths Bucket Regatta. Onboard the SW78 Whisper she took part in some transatlantic deliveries and some prestigious regattas such as Les Voiles de Saint Tropez and Loro Piana Superyacht Regatta. She is responsible for the organization, management and cleanliness of all interior areas onboard. She maintains an accurate inventory of all service items and supplies. She ensures cleaning and preparation of the vessel to the highest standards prior to any and all guests trips. She is in charge of provisioning the vessel for both guests and crew in all aspects of daily life. When guests are onboard, she ensures that they are properly cared for and that all their requirements are met. She offers a particular attention to details and a polite and entertaining spirit.